A call centre agent has a list of 305 phone numbers of people in alphabetic order of names, but Anuj does not have any of the names. He needs to quickly contact Danish Mank to convey a message to him. If each call takes 2 minutes to complete, and every call is answered, what is the minimum amount of time during which he can guarantee to deliver the message to Danish? So we get 0 at the 9th time, hence this is the minimum number of the count to find Danish. So total time taken = 9 * 2 = 18 minutes. There is an office consisting of 38 peoples. 10 of them like to play golf, 15 like to play football and 20 neither play golf nor football. How many like both golf and football? If a dice is rolled 2 times, what is the probability of getting a number 3 or 4? A shopkeeper charges 12 rupees for a bunch of cakes. Anuj bargained to the shopkeeper and got two extra ones, and that made them cost one rupee for dozen less than first asking price. How many cakes did Anuj receive in 12 rupees? => On putting 16, the equation is satisfied, hence the answer. Ram alone can do 1/4th of the work in 2 days. Shyam alone can do 2/3th of the work in 4 days. So what part of the work must be done by Anil in 2 days, for them to complete the work together in 3 days? Ram alone can complete the work in 2*4 = 8 days. Shyam alone can complete the work in 4*(3/2) = 6 days. Mr Mehta chooses a number and keeps on doubling the number followed by subtracting one from it. If he chooses 3 as the initial number and he repeats the operation 30 times then what is the final result? 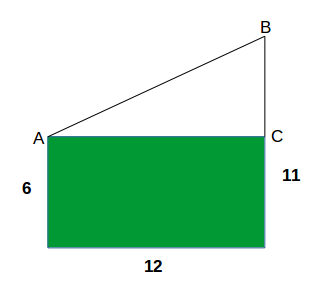 Two vertical walls of the length of 6 meters and 11 meters are at a distance of 12 meters apart. Find the top distance of both walls? For f(m, n) =45*m + 36*n, where m and n are integers (either positive or negative). What is the minimum positive value for f(m, n) for all values of m, n (this may be achieved for various values of m and n)? A white cube(with six faces) is to be painted blue on two different faces. In how many different ways can this be achieved (two paintings are considered same if on a suitable rotation of the cube one painting can be carried to the other)? First, painting on opposite faces can be achieved in 1 way. Second, painting on adjacent faces can be achieved in 1 way.